The modern center of San Remo starts in corso Matteotti, which is at the same time the most elegant street in town and the best place for shopping and strolling. It was designed in mid-nineteenth century and originally named after the first king of unified Italy, Vittorio Emanuele II, and later, after the war, it was named for Giacomo Matteotti, the Secretary of the socialist party who was killed in 1924. At one end of corso Matteotti, there is a memorial plaque over the facade of a palace recalling the stay of Umberto and Amedeo of Savoy in 1857. Strolling past boutiques, bars and restaurants, you can reach Borea d’Olmo Palace (at No. 143), which is the most beautiful private mansion in town. For 500 years the palace has belonged to the Borea family, of Venetian origins, whose name refers to the bora wind which sweeps across the Adriatic Sea. First they were recognized as marquises of Olmo under the Savoys, then barons during the Napoleonic Empire, and finally they were appointed dukes during the Kingdom of Italy. In this mansion, many renowned people were hosted by the Borea family: Queen Elizabeth of Spain in 1714; King Carlo Emanuele III in 1764; Pope Pius VII in 1814; and Prince Philip of Edinburgh in 1948. The stucco decoration on the façade is Baroque while the doors date back to the sixteenth century. A statue of the Virgin Mary with Child (ca. 1550) by Montorsoli, Michelangelo’s apprentice, can be seen over the door facing corso Matteotti. At the far end of the entrance hall, the coat of arms of the Borea family can be seen. The main floors of the palace are predominantly closed to the public except for the Town Museum of San Remo. The rooms of the museum feature vaulted ceilings characterised by late-eighteenth century frescoes by Giovanni Battista Merano. Within the museum, there are three distinct areas: the archaeological rooms; the legacy of the poet Laurano consisting of paintings and engravings; and the collection of Garibaldian relics once belonging to the English noblewoman and friend of Garibaldi Caroline Phillipson who lived in San Remo. Where corso Matteotti, via Faraldi and corso Mombello intersect, is the Cinema Centrale which opened in 1924 but was built and decorated according to the style of eighteenth-century theatres. With its Art Deco-style facade, it is certainly worth purchasing the ticket to see the amazing fresco on the vaulted ceiling of the inner hall representing an allegory of triumphant San Remo and a procession of nymphs and centaurs. Nearby, you will find the Tabarin del Centrale, built at the end of 1920s and restored with interesting paintings and statues. Finally, at No. 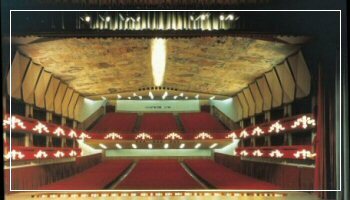 212, you will find the famous Cinema Teatro Ariston which is the seat of the annual Italian Song Festival.